Mikey Jayy here! Fall is officially here and now we are looking forward to our next event which is the Nomination, Red Carpet, & Press Event on Sunday, December 2, 2012 at Whisky A Go-Go in West Hollywood, CA located on the Sunset Strip. 2013 ARTISTS IN MUSIC AWARDS! A lot has been happening these past few weeks from placing new music on KGUP 106.5FM, securing the final slots for the Nomination, Red Carpet, & Press Event, to securing the final slots with artists to perform at the 2013 Artists In Music Awards. This event is special, because like the Summer Showcase, it's new to the entire program. At the Nomination Event, all Nominees from each of the 26 categories are invited to attend. During the event, the Top 5 Final Nominees will be named and asked to walk up on stage to collect their official 2013 Artists In Music Awards Nomination Certificate. As each Final Nominee walks up to the stage, a sound bit or video clip will be played as each artist collects their certificate. The Red Carpet will be laid out for artists to photograph with the newly awarded certificates. We secured the final performance slot with Leave It To Us, a Pop-Punk band from Coral Springs, FL. Leave It To Us is Nominated for three awards including Best Punk/Post Punk Artist, Best Alternative Artist, and Best Rock Artist. Leave It To Us has quickly grabbed the attention of a wide audience. They have played alongside national acts such as Jonas Brothers, Hit The Lights, and countless others. One important piece of news to talk about in this newsletter is the addition of Haster to the line up. Last year, Haster was a Final Nominee at the 2012 Artists In Music Awards. They have agreed to perform during the award ceremony and we are excited and honored to have them perform at the show. Haster can be described as "Alternative Metal movement spliced with Hard Rock influences". 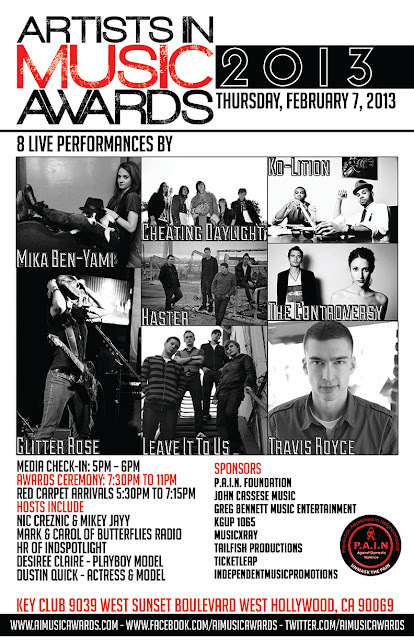 Plus, we just added 2011 Los Angeles Music Awards Power Pop Band of the Year winner, Cheating Daylight. Cheating Daylight was a Nominee at the 2012 Artists In Music Awards for Best Rock Artist and Best Pop Artist. This time, you get to see them perform twice as the award winning Power Pop band graces both stages at the Artists In Music Awards Nomination, Red Carpet, & Press Event on December 2 and then again at the Awards Ceremony on February 8. Early in August we secured a performance slot with Electronic/Hip Hop artist Travis Royce. Hailing from Portland, OR, Travis Royce brings a new flare to Hip Hop and Electronic music. While his sounds cross the two musical boundaries, there are definite characteristics that compare with The Prodigy, Voodoo Child, the Chemical Brothers, with a new spine on Hip Hop that is nearly impossible to compare his lyrical style. 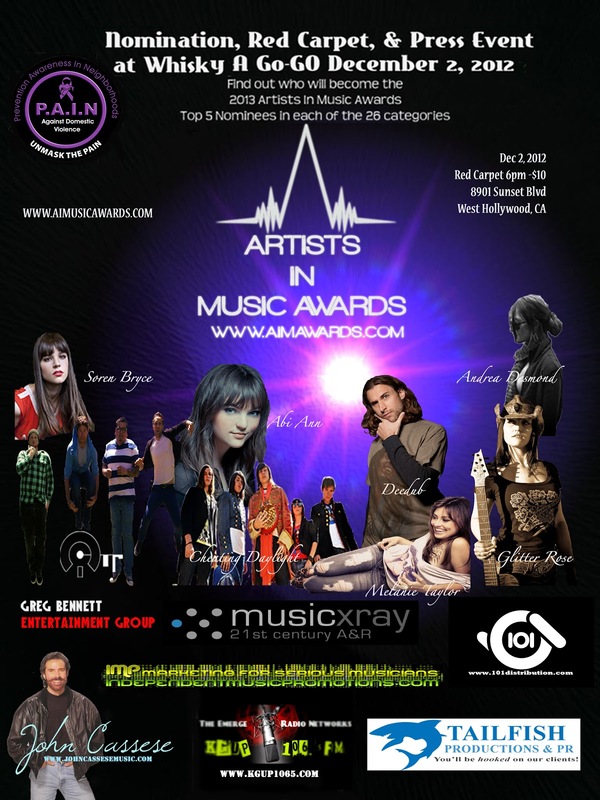 Cheating Daylight, Haster, Ko-Lition, and Travis Royce will join Artists In Music Awards Summer Showcase winners, Mika Ben-Yami, The Controversy, and Glitter Rose. 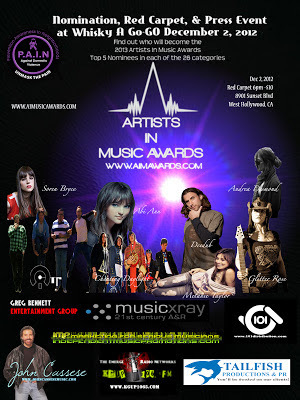 If you are interested in participating to win an award for Lifetime Achievement, Producer of the Year, Best Music Video, LGBT Person of the Year, and Best Radio DJ and/or one of the other 22 Music Awards Categories or you are interested in filling in the final performance slot at the 2013 Artists In Music Awards, please send us your EPK to http://www.aimusicawards.com/#!submit. THE FINAL SUBMISSION DATE IS OCTOBER 31, 2012. Join the official Artists In Music Awards newsletter and keep up to date with everything as it happens with the Artists In Music Awards.